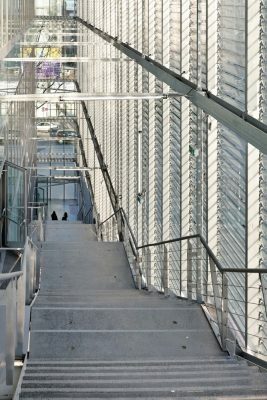 The partial reconstruction of the stadium Jules Ladoumègue has been realized in intricate connection with the new site of the RATP* maintenance center (*public transport service for the Ile-de-France). 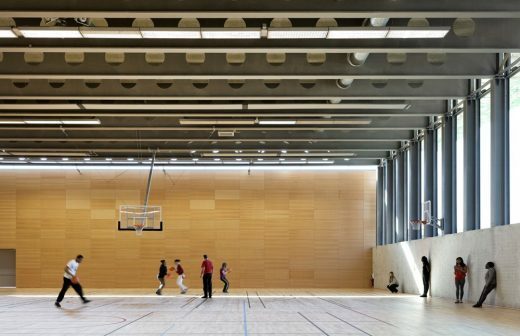 The construction of the maintenance center and the creation of new space for sport activities expresses the integration of big equipment in dense urban structure and emphasizes its multi functionality. The sport fields for soccer and rugby are situated on the rooftop of the maintenance center, at the same level with the Paris ring road boarding the site on the West. 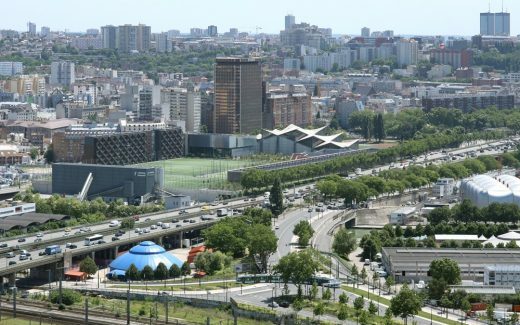 A building with six covered tennis courts creates a 200m long visual and acoustic barrier along the “periphérique”. A new building situated Route des Petits Ponts in the East completes the offer with new rooms dedicated to sport activities on four floors. Facing the new tramway station and connected to the existent Pagode building by an interior pathway, it distinguishes itself by its luminosity, its transparences and reflections. It indicates the new main entrance of the site. The stadium becomes representative of the new urban continuity between Paris and its outskirts. The notions of space, urban integration, and functionality but also those of light, transparency and comfort of use deeply contributed to the design. The main issue is to build in harmony with the environment while promoting a form of sensuality linked to lightness and transparency. Within the context of the reinforcement of the tramway line T3, the RATP (transport service Ile-de-France) chose to build their maintenance centre on the northern part of the Jules Ladoumègue stadium while the southern part with its field, grandstands and the gym called Pagode remains unchanged. The equipment of the northern part – soccer field, multipurpose fields and tennis fields (six of them covered) – are rebuilt 8 meters over the ground on the rooftop of the maintenance centre. 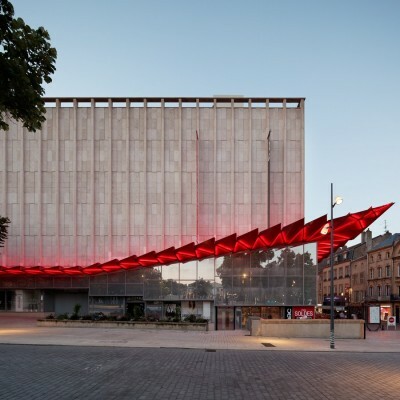 The project also includes a new building on the route des Petits Ponts, partially implanted on the esplanade. 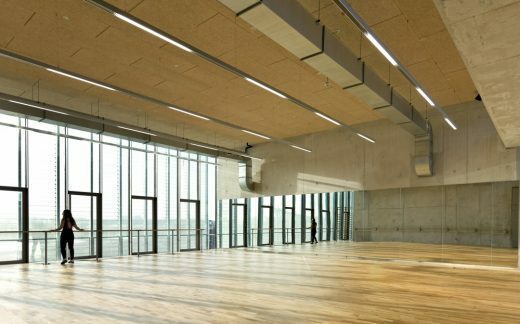 This building forms the entrance to the centre and comprises an indoor climbing wall, a gym, a dance studio, a fitness room, as well as grandstands, changing facilities, service equipment and offices. 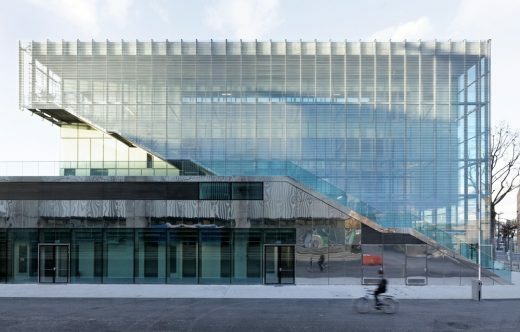 The new Sport Centre represents the desire to create an urban continuity between Paris and its outskirts, designed by the new tramway lines. The choice to put the facilities on the rooftop of the maintenance center expresses the multi functionality and integration of big equipment in a particularly dense urban structure. 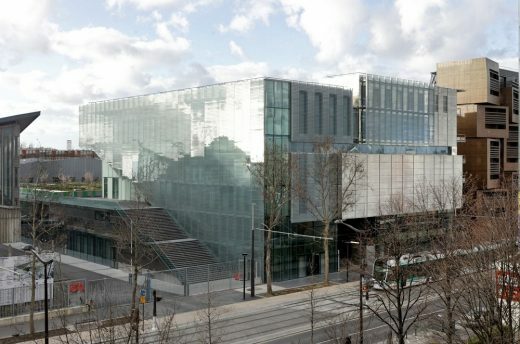 The interaction between the new building and the existing one designs a new “door” in front of the new tramway station. The expressive style of the Pagode on one hand and the transparency and lightness of the new building on the other, create a strong dialogue. The new entrance acquires an eloquent identity. Two public squares – the already existing square in front of the Pagode and the newly created square on the upper level – assure the continuity of the north-south route and strengthen the legibility of the site. The Pagode square is transformed into a meeting point connected to the square of Porte de Pantin by a simple walk along the existing grandstands on the North-South aisle. A lawn on the east part marks the limit with the tramway line. The central upper square, structured with new plantings, is a big surface free from sport activities and dominates the building site. The upper level with the sport fields gains its architectural power due to the monumental external staircase. Its generous dimension echoes the size of the upper level offering an unlimited view. In this upper area are situated the soccer and rugby field, as well as tennis and multipurpose fields. These different fields are connected through small paths and the flooring alternates planted and porous concrete areas. An opening in the north allows an impressive belvedere on the canal Ourcq. The covered tennis squares are implanted in the East, right alongside the peripheral boulevard. The building helps to reduce clearly the noise, air and wind pollution. This acoustic barrier is completed on the Northern side with sound barriers along the soccer field. Their transparency assures the view on the canal Ourcq and the diamantine shape grants an interesting play of lights as soon as night falls. 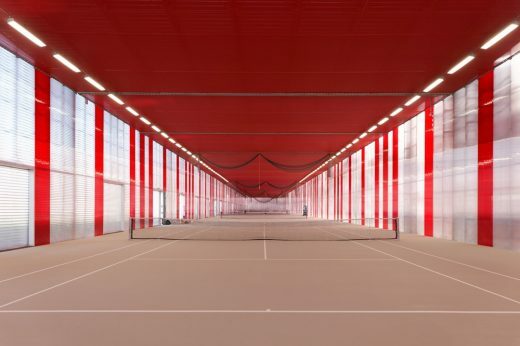 The tennis building is made of double skin façades with cellular polycarbonate panels. 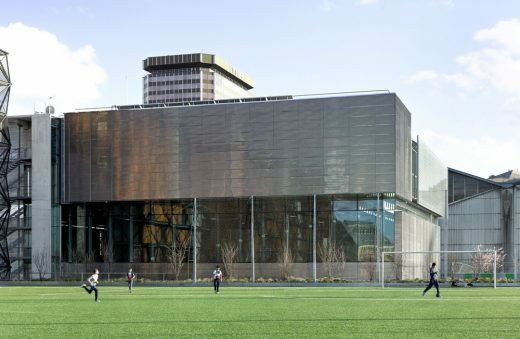 The east façade is protected from direct solar radiation by horizontal wooden sun shading devices, while the others are equipped with vertical lamellas that integrate moveable sun shading device. The rotation of these lamellas increases or reduces the solar gain and the intensity of light. The façade facing the peripheral boulevard alternates red and colourless translucent vertical panels reminding of the keys of a piano – a hint to the City of Music located just on the other side of the boulevard. 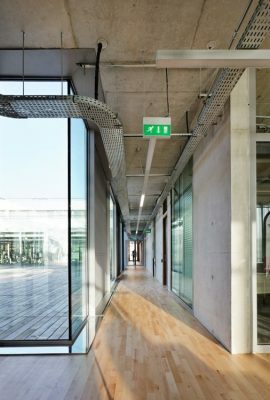 Regular sheds integrate openings orientated towards north, allowing natural ventilation and homogenous natural lighting. The south oriented part is equipped with photovoltaic panels. The “signal” building on the route des Petits Ponts emphasizes the new entrance to the centre. Its peculiarity is the vertical staircase connecting the street level with the slab, as well as all the other floors of the building in its continuity. 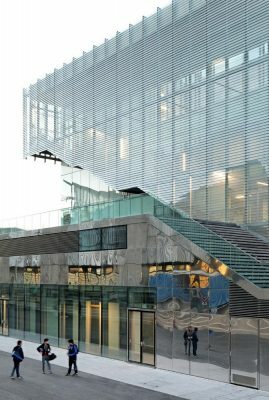 Special attention is paid to the finishing of the external facades and expresses the diversity of functions and the exemplarity of the building in terms of climate engineering. Fix and adjustable lamellas control the passive solar energy gain. When closed, they function as sun protection in summer; when open, they allow natural heating in spring, autumn and winter. These lamellas guarantee furthermore the regulation of the natural light and function as filter creating an intimate interior atmosphere. The variation in the lamella’s inclination creates an effect of animation and lightness on the building. Opaque sections draw the horizontal structuration of the building. 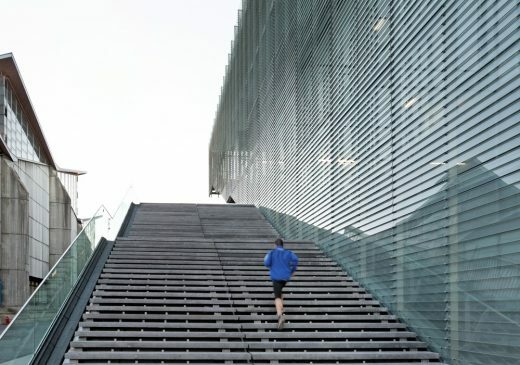 The opaque walls of the gym and the squash fields differentiate due to their polished and pleated inox panelling; this material makes the façades look brighter and reflects the lights of the city. The multipurpose hall is situated on the 2nd floor. The changing facilities can be reached through two entrance halls both accessible form the main staircase, a hall on the upper floor and one on the level of the grandstands. The access for the public to the grandstands is situated in the central entrance hall. The 4th floor is organized around a patio accessible for the users. This wooden floor patio offers an external meeting point, as well as a restroom and an external fitness area. The different halls – the clubhouse that serves as entrance and recreation hall, the dance hall, the gym, the fitness room and the squash fields – are organized around the patio. The changing facilities for the specific activities are situated in continuity with the club house. 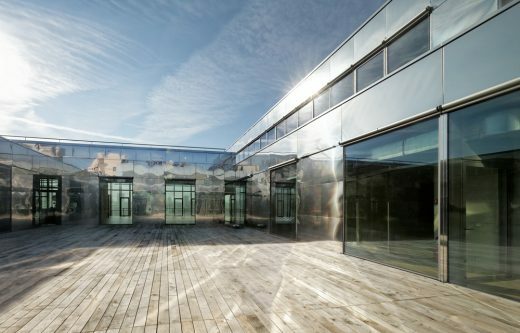 The glass fronts guarantee a visual link between the different halls. All levels are connected through an elevator in the entrance hall. The climbing area is integrated in the base and forms a unity of its own. The entrance is located on the inner street in front of the Pagode building. 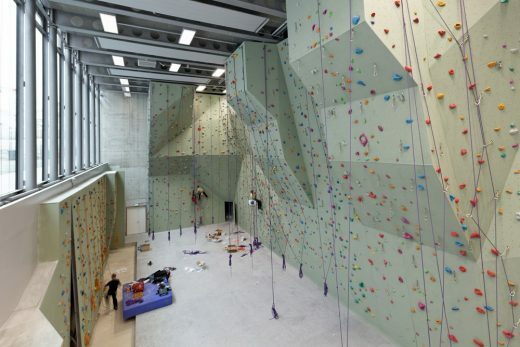 The changing facilities are situated on the ground floor, while the climbing hall is located six meters under the street level. It can be reached through a staircase and an elevator situated next to the entry. It is a big volume naturally enlightened from the southern façade. Due to the difference in the height of the halls, the caretaker’s flat is integrated in the global volumetry and is located on the 5th floor.